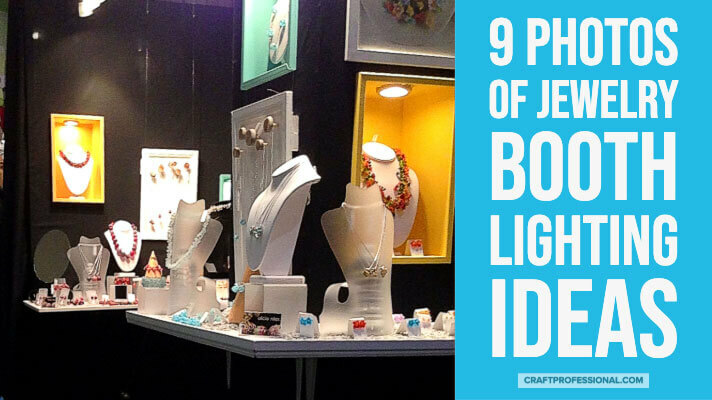 I went on the lookout for examples of great jewelry display lighting, and I found plenty to help you design your own booth lighting whether you sell jewelry or any other handmade items. The thing with great lighting is, unless you're looking for it, you don't really notice it when you're casually browsing a craft booth. But you do notice something is missing when there's no lighting, especially at indoor shows. Lighting can be tricky, but there are plenty of great options and opportunities to get creative. 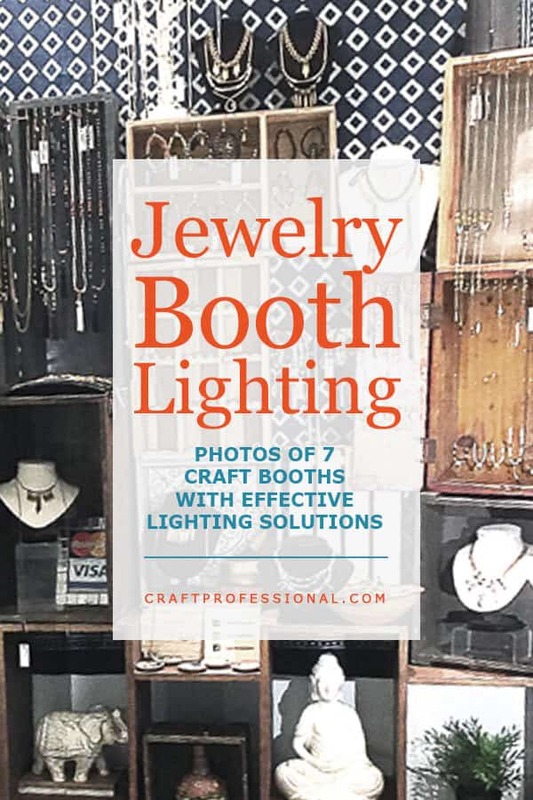 I've researched several jewelry booths that use some fantastic, and creative lighting solutions. I know it can be tough to find the right booth lighting, so where possible, I've included links to help you source similar lighting for your own booth. If you don't sell jewelry, you should still check out these examples. The lighting solutions will work for many types of craft displays. I completely adore this booth. Look closely at the yellow and blue-green boxes in this first photo. They are rectangular display boxes that are large enough to comfortably hold a jewelry bust. The boxes are set into the black walls of the display. 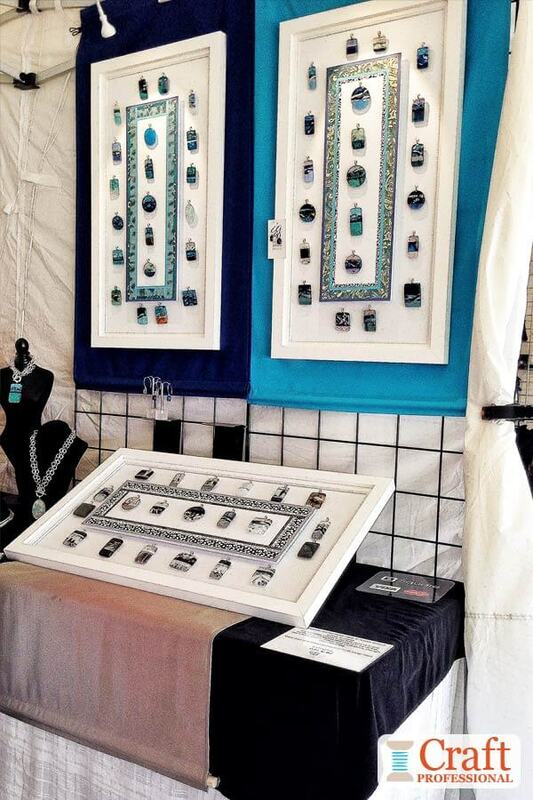 Each display box creates a focal point, making the statement necklaces display within appear truly special. The bright puck light style spotlight inside each box highlights the gorgeous statement necklaces on display. 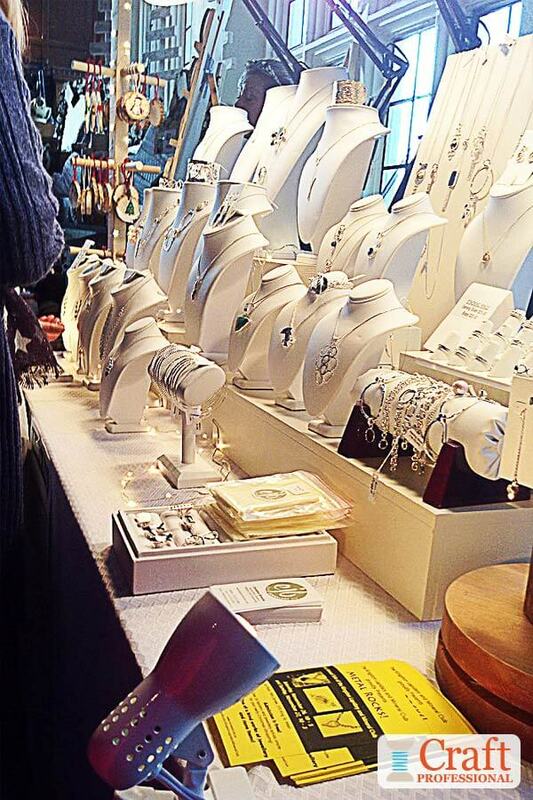 Add to that some good lighting from above, and this jewelry booth is really something special. 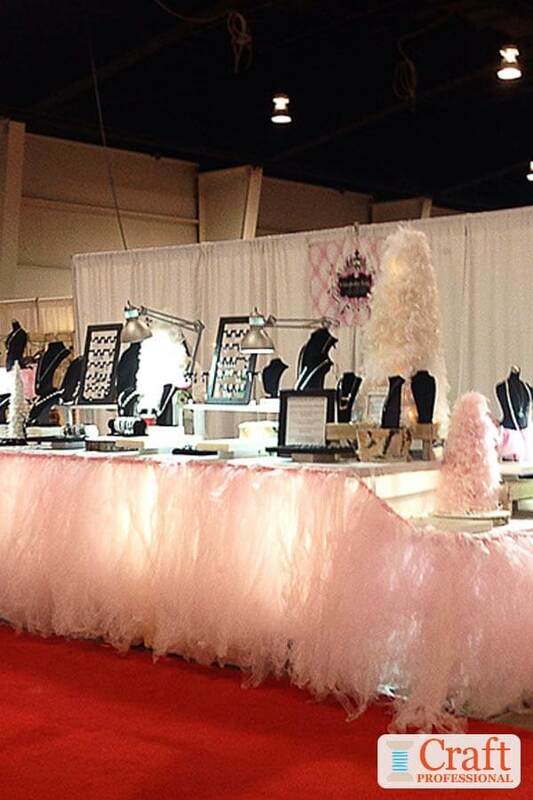 This booth makes a big impression with tulle and lighting. Notice the light shining from under the tulle. It draws your eye instantly to the display. This booth was a big draw at a large and very busy show. This booth was set up at a Christmas craft show, and the tulle fits with the festive theme, but it isn't too holiday-specific and could work year-round. Notice the spotlights on the table top. 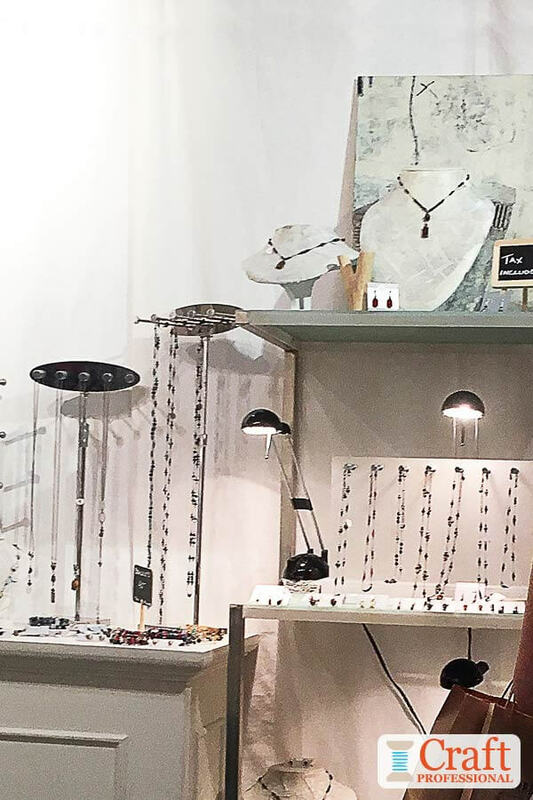 The adjustable swing-arm style lamps allow the light to be focused wherever it is needed and gives this jewelry artist more flexibility in setting up the booth. You can't see this in the photo, but I'm almost 100% certain those swing arm lamps are clamped to the table top, so they take up less space, and are not easily knocked over. Where's the lighting in this booth? It's tiny. You really have to look for it. 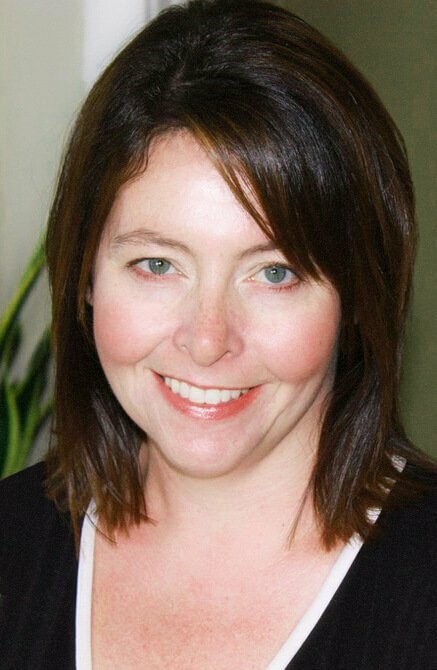 Check out the top left corner of the picture, you'll see a small white clip-on light focused on the framed jewelry. It's inconspicuous, but it does the job, lighting up each of the white display panels. This booth is actually quite lovely and clever. You can see more photos of it here, including more of the lighting. 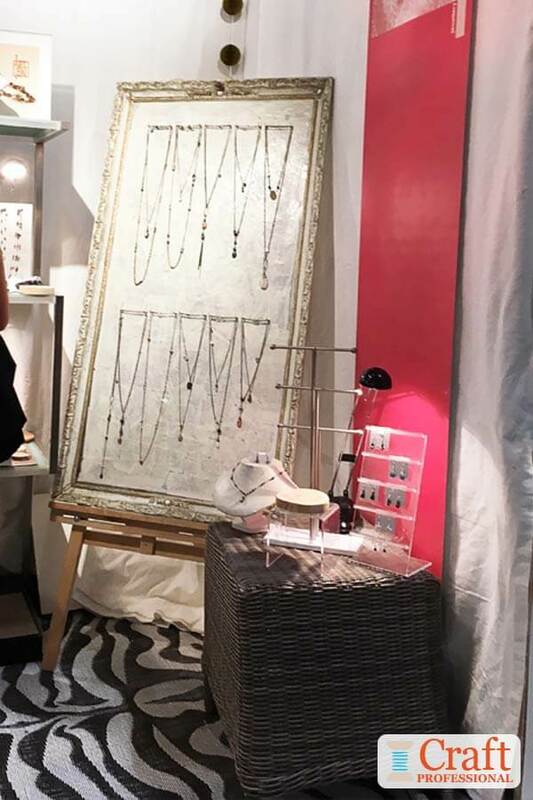 Overhead jewelry display lighting clipped to a U-shaped frame is effective and not intrusive. The frame, used to display jewelry and hold the lights could be made of anything - wood, metal, plastic... Whatever it is, the loosely wrapped white fabric makes it fit with the booth's look, and could very likely be hiding all kinds of clips and cords attached to the lights. The two photos below show two sides of the same booth. They illustrate what a big difference some simple lighting can make in your display. The little vignette of handmade jewelry displayed on a wicker basket (also good for storing and transporting light items) shows the power of a single spotlight to transform a space. Without the light, this corner would be dreary and unremarkable. Also, the splash of pink color on the right that brings some life to an otherwise neutral booth. Big, overhead lights brighten up this display. Although they are very noticeable in the photo, in reality, they blend right into the booth. I love the stacked crates used to create height and display pieces of jewelry here. 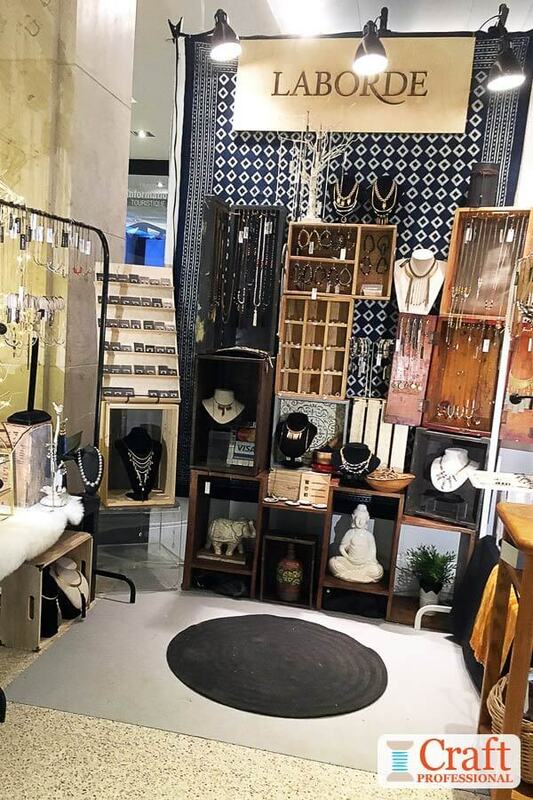 The graphic black and white pattern in the back of the booth adds visual interest without detracting from the jewelry, and the matching rug finishes off the look of the space and provides extra comfort for customers' tired feet. I wish I had zoomed out just a bit when I took this photo so you could see the contrast of the extremely dark space this jewelry booth occupied. It was a lovely room, but the walls were dark, and the overall lighting in the room left a lot to be desired. 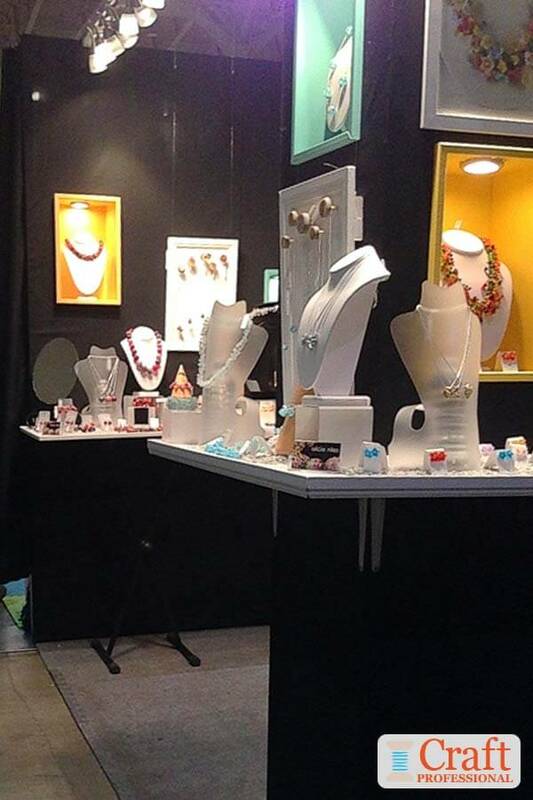 With that in mind, you can see what a fabulous job this jewelry artist has done lighting up her booth. Notice the clip-on spotlight illuminating the booth in the bottom of the photo. If you look closely at the top of the photo, you can see the black arms of more lights brightening the space. This was a very busy booth. The lighting absolutely makes the display and allows the jewelry to sparkle. Without it, the jewelry would lose a big part of its allure, and customers would have simply kept walking. 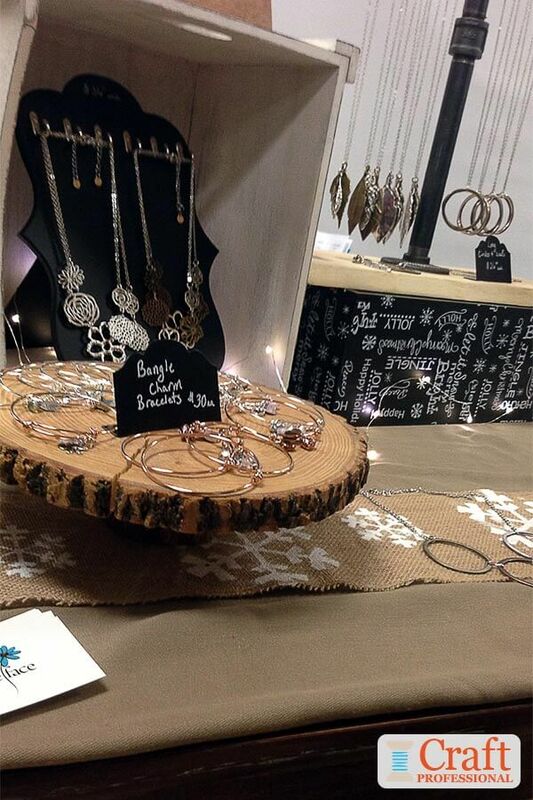 Finally, here's a booth that uses sweet fairy string lights to add interest to the display. 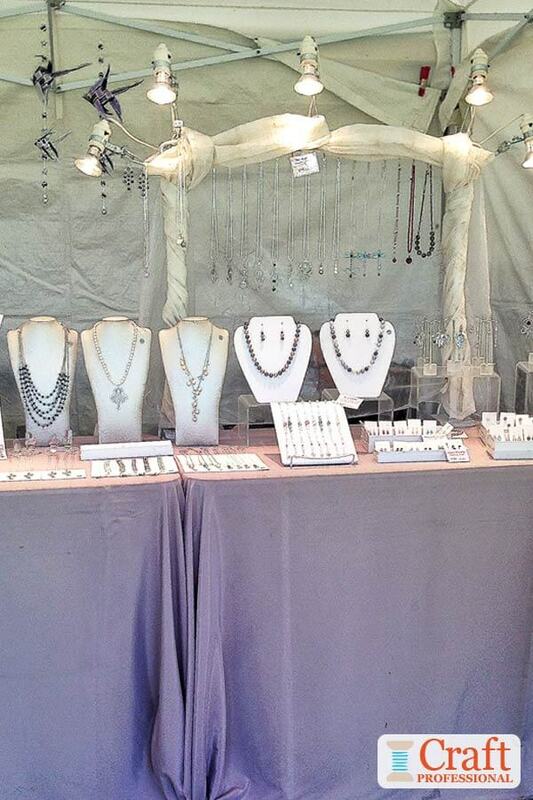 Fairy lights aren't going to add a lot of brightness to your booth. You can't rely on them alone. However, they are cute, affordable, and come in battery powered versions, so you don't have to worry about finding an electrical outlet. They add a little extra fun to your booth. Although they could be used year-round, they are perfect for adding a little bit of festive sparkle for Christmas craft shows. Plus, they look stylish in your home, so you can use them as home decor when you're not at a show. Craft and jewelry display lighting has really come a long way in the past few years. There are plenty of affordable options available to suit a variety of booth styles and configurations. What I find most exciting is, for a reasonable price, you can find all kinds of small, rechargeable or battery operated clip-on lights that add a lot of illumination to your booth, and don't require cumbersome power cords or access to electricity.